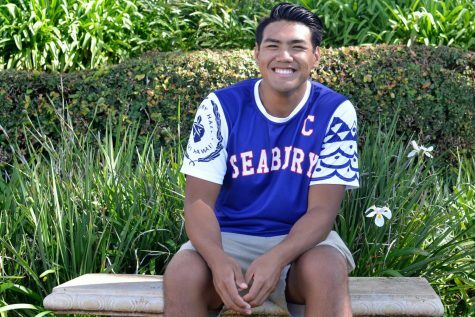 Ashton (Kainalu) Kubo is a senior at Seabury Hall. He has been attending the school since his freshman year when he moved from Kamehameha Schools Maui. At Kamehameha, Kubo was usually found with an ukulele in his hand and the lyrics for “Chocolates and Roses,” “Ehu Girl,” or “Sunday Morning” coming out of his mouth. Although hesitant at first, Kubo decided to make the decision to enroll and attend Seabury Hall for high school. At Seabury, Kubo eventually found interests that helped ease the transition from Kamehameha. One of these interests included playing sports. Kubo found his love for indoor and beach volleyball during his freshman year when he decided to try playing for the first time. He also is the captain of the paddling team and occasionally plays club soccer. Alongside sports, he also found different academic classes to suit his interests. His favorite classes include Global Issues, World Views after 9/11, and Spanish. His younger brother, Zach, also attends Seabury and is in the eleventh grade. Outside of school, Kubo can usually be found looking at shoes online, watching random cooking videos, playing beach volleyball with his friends, or searching for the best cold brew coffee. He travels occasionally, visiting Australia, Tahiti, Canada, and the continental United States. His dream is to one day become a world traveler with a passport filled with stamps. Kubo hopes to eventually receive a degree in Physical Therapy/Kinesiology and become a physical therapist.